What do you really know about the “SAFE Act”? 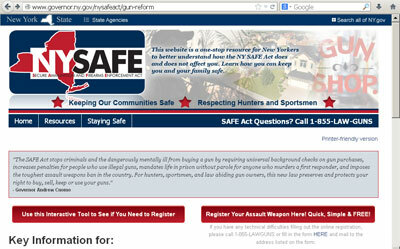 Click on the above webpage image to visit the SAFE Act gun reform webpage. Really? Since when do most criminals actually make purchases from the local gun store or a gun show? Criminals prefer to purchase guns from other criminals who probably stole them in the first place and thus make them harder to trace. Criminals are not looking for a really nice hunting or sporting gun or some nice collectible to display above the mantle. Criminals prefer the cheap “Saturday Night Special” type of gun. 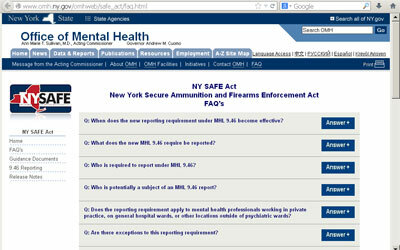 Click on the above webpage image to visit the NY Office of Mental Health FAQs webpage. Check out the FAQs and see how the state believes that the privacy between you and your Doctor no longer exists. Perhaps you get super nervous about flying and get a prescription to help you fly to your vacation destination. Now the state thinks you need to have your gun rights investigated and possibly take away all your guns. This has already happened. How many people who need some serious mental help will now decide not to seek help? 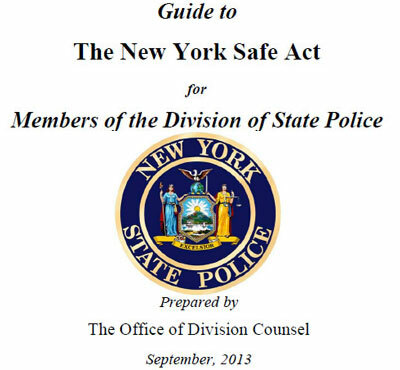 Click on the above to read/print the New York State Trooper’s SAFE Act Field Guide. Click on the above to link to the New York State Sheriff’s Association’s response to the SAFE Act. The New York Secure Ammunition and Firearms Enforcement Act of 2013 commonly known to many of us as the “un-SAFE Act” is a gun control law in the state of New York. It was sponsored by State Senator Martin Golden. Tuesday, January 15, 2013: The bill passed State Assembly. Tuesday, January 15: Cuomo signed the bill half an hour later. April 15, 2013: Begin registering assault weapons. January 15, 2014: Ammunition background checks begin. April 15, 2014: All assault weapons must be registered by this date.